Glass splashbacks and glass worktops may look great in your kitchen. But they also look outstanding in your bathroom. 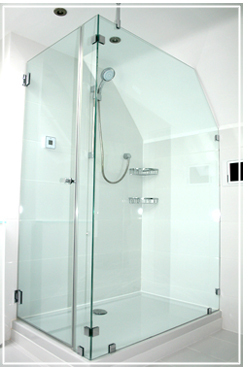 In fact, when it comes to your bathroom, glass (as you're already no doubt aware) plays a huge role. 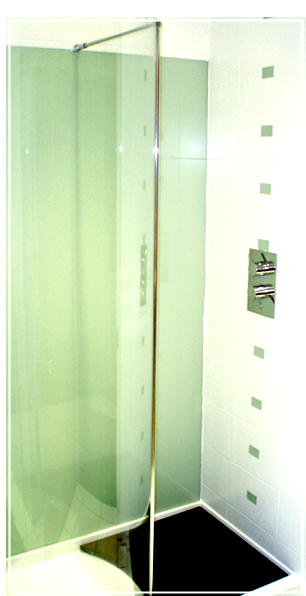 Whether it's a bath shower screen or a full glass shower enclosure with coloured glass splashbacks on the walls the ideas for bathroom design become truly exciting. Here at Kitchen Calm we specialise in glass splashbacks and glass worktops primarily for kitchens but we do have a sister company which goes by the name of Bathing Bliss and they specialise in glass for bathrooms. (like the one to the left). In fact they are solely a made to measure or bespoke company so all of the products they sell are designed around your exact specification. So should you want a coloured glass worktop or a bathroom glass splashback or both and combine them with a beautiful shower screen then please either click the images to the left and right or click here and visit Bathing Bliss. Alternatively give us a call on either 0845 0450336 or 01642 648444 and we'll put you in touch with the ever helpful team at bathing bliss.